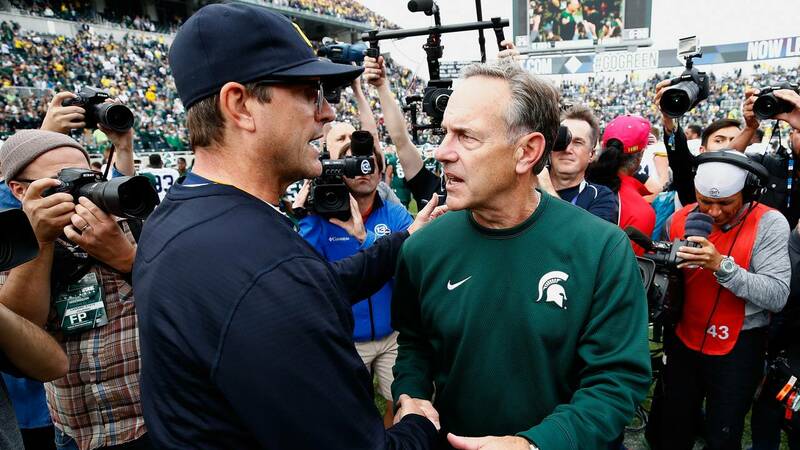 ANN ARBOR, Mich. - A week ago, as the Michigan football team prepared to host Wisconsin in the Big House at night, this week's rivalry game against Michigan State didn't seem to be as much of a threat. The Spartans had lost by double digits at home against Northwestern and looked destined to fall to 3-3 after a game at Penn State. But everything changed when Mark Dantonio went into Happy Valley and came out with a win, crushing Penn State's championship aspirations and keeping his own hanging by a threat. It's what Michigan State does -- what's it's always done under Dantonio. Michigan can expect to see that same MSU team Saturday -- the one that lost to Arizona State and Northwestern nowhere to be found. Throughout the Dantonio era, the Spartans have saved their best for the Michigan game, which is a big reason he's 8-2 in the rivalry this decade. Sometimes, like this year, Dantonio had less talent to work with, but it often didn't matter. It didn't last year. Michigan has a lot on the line this weekend. It's not just playing for bragging rights and the Paul Bunyan Trophy. 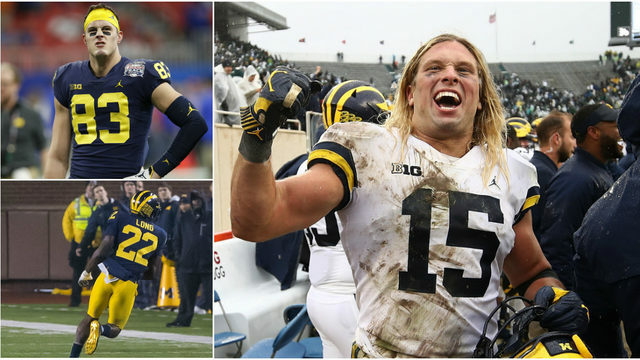 The Wolverines are squarely in the Big Ten championship conversation and hoping to compete for a College Football Playoff spot. Michigan has only played on the road twice this season, and the first halves were disasters both times. Notre Dame jumped out to a 21-3 lead in the first 26 minutes, while Northwestern was up 17-0 just two minutes into the second quarter. Even though MSU lost to Northwestern, it would be much tougher for Michigan to make up that deficit against its in-state rival. The Spartans have had their own issues with slow starts, trailing Utah State for almost the entire first half at home, losing the first quarter to Central Michigan and spotting Northwestern a 14-3 lead. Both teams have gotten better as the game moves along, so whoever jumps out to an early lead will have a major advantage. Two of the most important pillars of discipline in football are penalties and turnovers, and Michigan is on opposite ends of the spectrum in those areas. 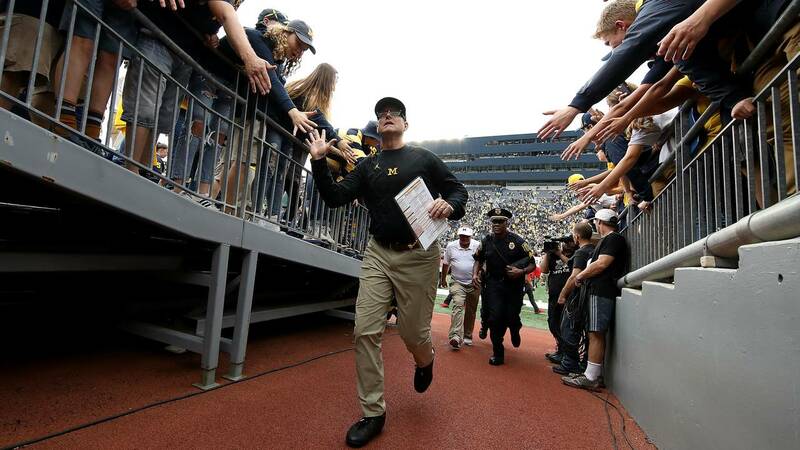 Jim Harbaugh's team has only committed five turnovers this season, fourth in the country. It's no coincidence that Michigan lost its only game with multiple turnovers and is undefeated since. Penalties have been a different story, however, as Michigan is among the most penalized teams in the country. An average of 7.6 flags have been accepted against Michigan for 69.7 yards this season, 106th in the nation. The Wolverines played nearly a perfect game against Wisconsin, committing just one penalty for 15 yards. As a result, the Badgers had trouble sustaining drives and couldn't convert on third down. Penalties in the secondary killed Michigan against Notre Dame, and it took 11 flags for 100 yards to keep Northwestern competitive with the Wolverines. Michigan has beaten itself too often against Michigan State, so those mistakes need to be corrected. 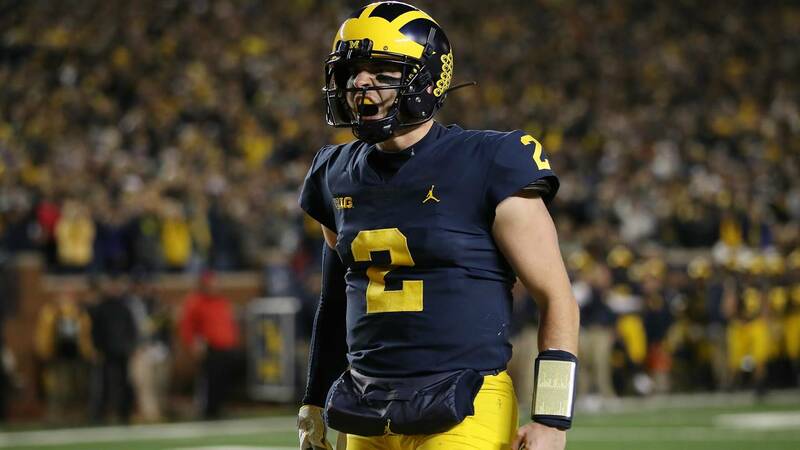 Harbaugh's offense has undergone a complete makeover this season, from Shea Patterson to the offensive line to the skill players. 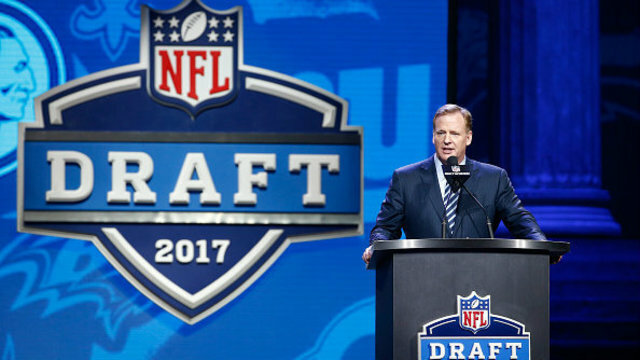 No improvement has been as dramatic as its big-play potential. Michigan has already made 37 plays of at least 20 yards, 18 plays of at least 30 yards and 11 plays of at least 40 yards this season -- all among the top 30 teams in the country. Last year's Michigan team only had 28 plays of at least 30 yards and 14 plays of at least 40 yards in 13 games. The Michigan State defense isn't susceptible to big plays, boasting top-30 marks in stopping every category mentioned above. The Spartans have only allowed seven plays of at least 30 yards, which means they're forcing teams into long, methodical scoring drives. 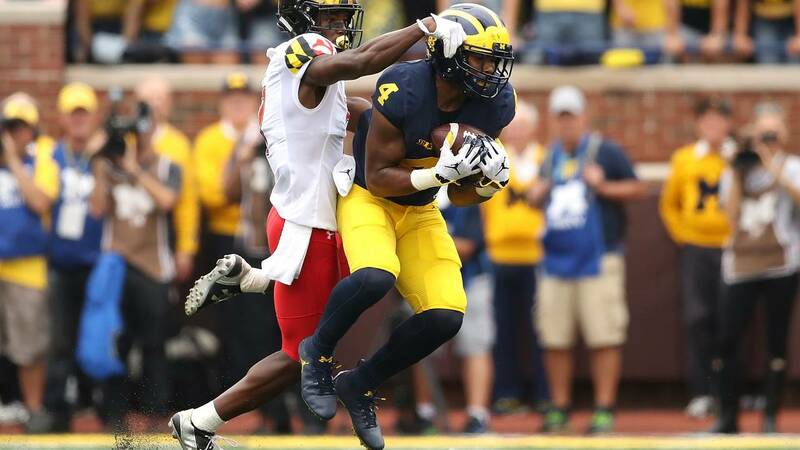 Michigan's big-play specialist has been Nico Collins. The sophomore has six catches for at least 15 yards and four catches of at least 25 yards. He's averaging 16.44 yards per catch this season. The Wolverines haven't gone to Collins on third down, but he's a lethal downfield threat on the early downs. MSU owns the top rushing defense in the country, and it shut down Trace McSorley last week. If Michigan can connect on some big plays, it will open up the running game and allow Patterson to run the balanced offense he's demonstrated over the last month. Running quarterbacks have been Michigan's downfall for years, even during the Don Brown era. Brandon Wimbush exposed that weakness with some critical runs during the Notre Dame game. Brian Lewerke is another quarterback who can make plays with his legs, though sacks have skewed his rushing totals this season. Factor out the 15 sacks for 114 yards and Lewerke has gained 197 yards on 40 carries. Michigan State has multiple impactful injuries up front and at wide receiver, so Michigan should be able to keep Lewerke uncomfortable. 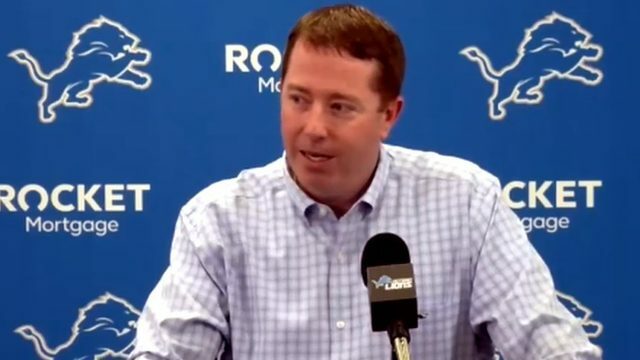 The combination of talented pass rushers and elite cover cornerbacks will make it tough for Lewerke to extend passing plays. That's why Michigan has to stay disciplined and contain him in the running game. Lewerke made a major impact on the ground in last year's game, and Devin Bush and company have to shut that down Saturday. 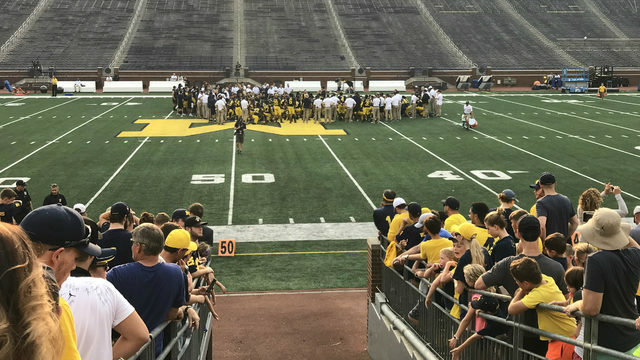 Michigan players young and old have been peppered with reminders of the team's struggles against rivals and on the road. Saturday can't change the outcome of last year's game or erase a decade of being owned by MSU and Ohio State. But a win would keep this year's goals intact. One win can lead to two wins, three and so on. But all that matters for Michigan this weekend is escaping East Lansing with one win. MSU always comes into the rivalry playing loose and puts together its best game. It's time for Michigan to return the favor. It doesn't matter that Michigan has lost 17 straight against ranked teams on the road. This team has a chance to make everyone forget about that streak with a single victory. Michigan State has a good team. Michigan is even better. Harbaugh's group just has to prove that Saturday on the field.